All this week, Nashville's W.O.M.E.N. 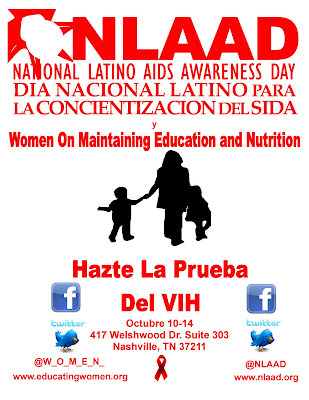 (Women On Maintaining Education and Nutrition) is promoting National Latino AIDS Awareness Day and HIV testing. W.O.M.E.N. has Spanish-speaking staff and also a food pantry. The agency is located at 417 Welshwood Dr., Suite 303, Nashville, TN, 37211. There is also a Spanish-language announcement on the W.O.M.E.N. web site. 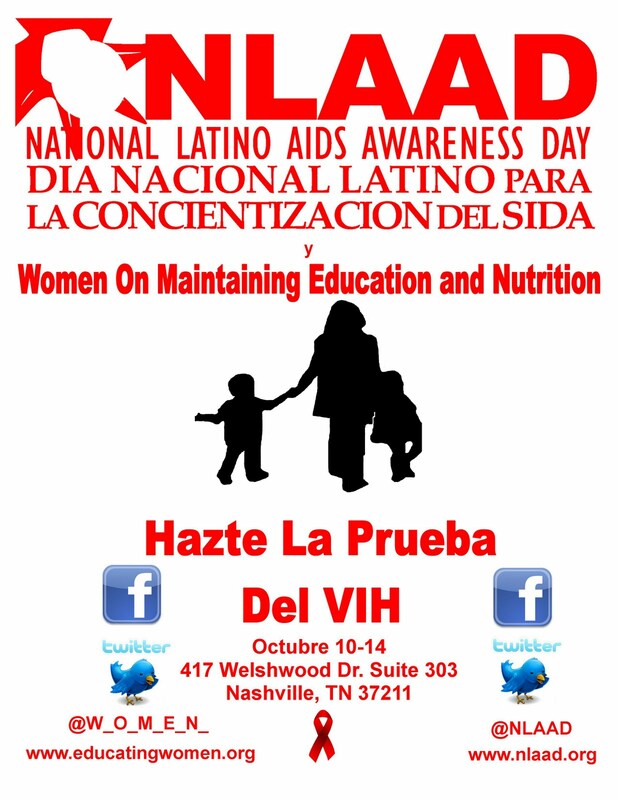 October 15th was established in 2003 as National Latino AIDS Awareness Day (NLAAD) in response to the devastating impact HIV/AIDS has on Hispanic/Latino communities across the country. It was established to draw attention to the critical role HIV testing and prevention education plays in stemming the spread of HIV/AIDS among Hispanics/Latinos. It is a day during Hispanic Heritage Month that organizations around the country use to promote and sponsor activities that respond to the state of HIV/AIDS among Hispanics/Latinos in their specific communities. According to NLAAD, Hispanics/Latinos progress to AIDS faster than any other racial or ethnic group with 42% being diagnosed with AIDS within 12 months after learning of their positive HIV status compared to 34% late diagnosis among white non-Hispanic and 35% among blacks. Hispanics/Latinos represent 16% of the population but account for an estimated 18% of people living with HIV and 18% of new infections. Improvements in health status are attributed to raising awareness, promoting HIV testing, disseminating prevention strategies, and connecting Hispanics/Latinos to health care.